An elderly man came to the library; he seemed to be bothered by something. I stopped my work and gave him my total attention. His discontentment was justified, and I couldn’t do much to help him. I simply listened to him. Somehow, the conversation evolved from personal to universal topics. Together, we slowly dove into the soft and vulnerable waters of the Heart. With our words, we touched the pain of the human soul, the longing to find the deepest meaning in daily life, the need to offer whatever our hearts can give. The face of the man changed from one minute to the next—softness and vulnerability emerged in his eyes. I tasted the rare treasure of a conversation with someone who knew the art of listening and self-expression. There were no empty or useless words, and the delicious moments of silence guided us deeper into the music we were creating together. We found ourselves traveling into the depths of our humanity, sharing the journey of discovery of that which is beyond words. 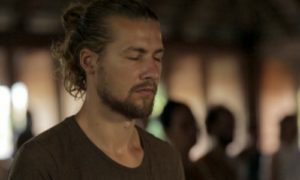 The words led us to sacred silence, and at a certain moment, there was such a depth of connection that I felt tears welling in my eyes. But, I couldn’t allow myself to cry in front of a man whom I had met only minutes before. I was there… in the space of compassion, love, connection… stepping out of my “little I” into something mysterious, the deep longing of the Heart. A conversation with a stranger became meditation. During the 49-Day Prathyabhijna Retreat, I experienced that true listening is a direct door to the Heart: our deepest “I.” The act of listening is entering the space where love is ever-present. If we really listen, everything becomes our teacher, everything reveals the Truth. When I look inside myself, I see clouds of worries, tendencies, fears, plans, strategies… All these aspects of my humanity want to express themselves and call for attention. My intention is to accept them. They are an expression of the need to love myself and live a fulfilled life. We wander through the deserts of our loneliness while our souls search for these sacred encounters that fill us with awe. We long for heart meetings with humans, animals, nature. Our deserts are simultaneously fields of love, and we walk through them without being able to experience this love. This is our human conditioning. Deep listening is a way to break through this conditioning. During the seven weeks of retreat, I listened to the birds from morning until night and discovered an amazing universe inside their songs. Even when we walk through a dark valley, the birds are always singing. Their expression of joy, sweetness, and freedom vibrates in our ears and enters the castle of our bodies. There is no way we can stop their music. They sing inside us. We are constantly penetrated by their innocence, by Nature’s offering to our senses. And, the act of deep listening is the act of awakening our sensitivity. Listening to the birds became my meditation. Hearing their music was a way to connect to my soul, to turn into a bird and fly inside myself—enjoying my inner landscape, discovering my beauty. Every vibration of my soul was pointing to the Source. I was getting drunk on God. When I came out of retreat, it felt like living without skin. My sensitivity was extreme. I knew I had found a treasure, and I didn’t want to lose it. The busy-ness of the people around me was a very weird phenomenon. I didn’t understand why they were moving so much and doing so many things. I just wanted to dive into beauty. However, life guided me to action and I started to lose the capacity for deep listening. The ego returned, with its painful fears and worries. And I could feel pain as deeply as beauty. Six months have passed, and I am still in the process of integrating my retreat experience. My thoughts are clearer, but I still have a tendency to get lost in them. When the mind is busy, I forget about beauty. And yet, I know that it is always there. Wonderland is waiting for us. It is only about listening with our whole being. 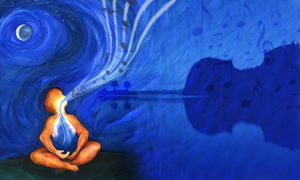 If we bring this listening ability to life, everything can become meditation. We can fill every moment with presence; we can make every encounter a source of living water. The Universe is constantly singing a Sacred Song. All we need is to tune our hearts to hear it. Beata is a Hridaya Yoga teacher who has participated in two 49-Day Prathyabhijna Retreats. She is also a frequent contributor to our blog. You can read all her posts here.